Intrepid Shopper Unbelievably Catches the Woman Who Stole Her Wallet After Being 'Seized by an Instinct"
In the ultimate consumer advocacy fantasy, a Brooklyn woman tracked down the thief who went on a shopping spree with her pilfered wallet based solely on quick thinking and intuition. "I started yelling at her," said Mrs. Wohlhendler. "At first she denied that the card was mine, but then she started yelling at me. She started running away towards the back of the store, but I ran after her, calling for security. She started throwing the merchandise from Urban Outfitters at me, then some cash, then my wallet, screaming ‘here is your stuff back, it is just a mix-up.'" 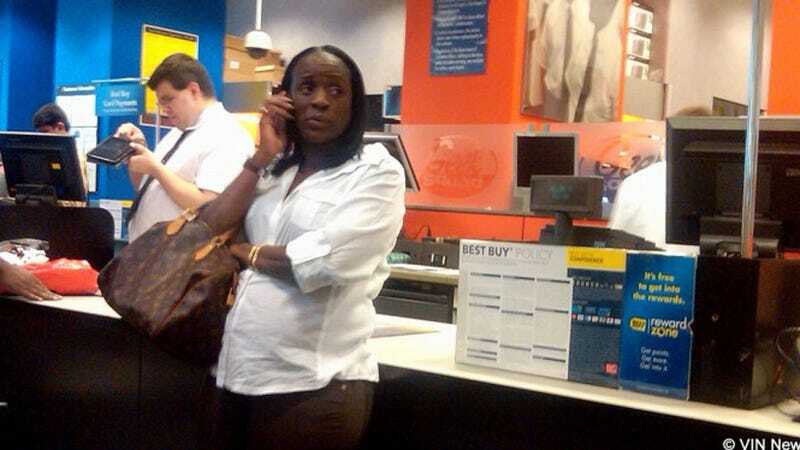 Best Buy security detained the woman and insisted that the pair wait for police to clarify the matter. The police arrested the woman (pictured above, in a photo taken by Wohlhender before she apprehended her suspect), and Wohlhender got her wallet back. The incident will go down in history as the most successful shopping trip of all time.